The following comments about attractions in Havana have been posted from individuals. We believe that the best reviews of Havana, Cuba are written by travellers and holiday makers who have experienced Havana first hand and want to share their thoughts. Can you share yours? 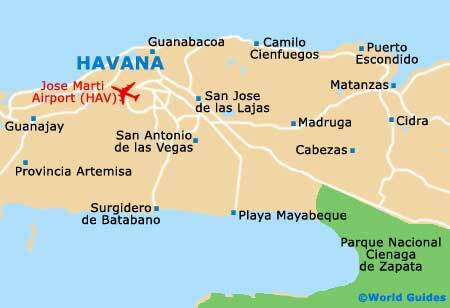 Please help us expand this section of our Havana World Guide. Let us know what you think about the attractions in Havana, Cuba. Submit comments about Havana attractions here. I was in Cuba (Havana, Cienfuegos, Trinidad, Vinales, Pinar del Rio Sorora Feb 1-13, 2013. Good - weather, nature, architechture. Ugly - poverty, diesal fumes. You might also wish to visit the Old Square. Don't be put off by its name in Spanish, which literally translates as 'New Square' as this is the title that was given to it shortly after being unveiled! Posted on 28/12/2011 by Georgie N.
I was interested in Old Havana the most compared to other parts of the Cuban capital and I hope it never changes. The guide I had said that things have stayed the same as they were in the late 1950s with old buildings, cars, and other items from that era. Time has stopped here and anyone with an interest in Cuban history should head here. Also a great scenic walking area. I don't think you would have been overcharged. Did you notice that there were two buildings? It's 8 CUC to visit both and 5 CUC to visit just one of them. Even though I'm not particularly a fan of art or museums, I loved the National Museum of Beautiful Arts of Cuba. There were a lot of new pieces but I particularly enjoyed the glimpse at colonial Cuba that was offered by some of the older work. Not sure if I was overcharged for entrance though. We are literature lovers, so the visit to Ernest Hemingway was a must for us. It's known as the Fincia Vigia if you're going to ask the locals or a taxi driver about it and this is where some of the best novels and novellas of all time were penned. Just wish we could have gone inside!